Companies in the global esterquats market are seeking well-thought community management along with growth marketing plans for gaining a competitive edge over their competitors. Tactful leverage of digital marketing has become imperative for the companies that aim at capturing mindshare of their consumer post-launch of their products. New market entrants are carefully selecting their genres and niches, so as to compete on equal footing with leading players, who possess end-to-end development studios, years of skills & experience, and larger production capabilities. With rising competition in the global esterquats market, both regional and local competitors are witnessing parallel growth, led by strategies such as technological innovation and M&A for gaining an edge over their competitors. Emerging players are facing difficulties to compete with established vendors in terms of product reliability, quality issues, and technological innovations. A new report of Transparency Market Research profiles key players underpinning expansion of the global esterquats market, which include Evonik Industries, Kao Chemicals, Akzo Nobel, Stepan Company, Solvay Group, Berkshire Hathaway Inc., Italmatch Chemicals S.p.A., and The Dow chemical company. 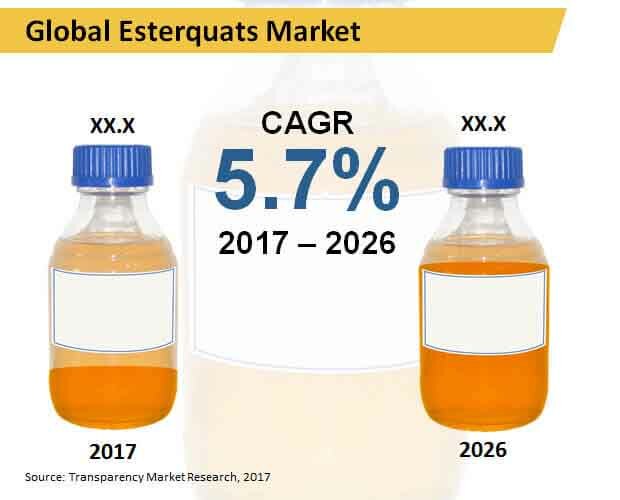 The report foresees the global esterquats market to exhibit a steady increase in revenues during the forecast period, 2017 to 2026. Sales of esterquats across the globe are estimated to bring in nearly US$ 3,400 Mn revenues by 2026-end. On account of their excellent environment-friendly profile, esterquats are gaining immense traction as the surfactant of choice over the conventional quats or distearyl dimethyl ammonium compounds. Palm-based esterquats, in particular, are gaining huge acceptance over animal-based raw materials. Properties of palm-based esterquats have been deemed comparable with commercial esterquats, as derived from tallow, thereby making them suitable for production of fabric softeners. In the anti-static property, palm-based esterquats exhibit high performance toward acrylic and polyester fabrics. Factors such as the supportive government regulations imposed that mandate utilization of environment-friendly products are likely to pose a positive impact on demand for esterquats in the upcoming years. Technological advancements in esterquats have led toward the development of the ultra-concentrated products that have upto 25% solid content. These advancements have further facilitated availability of cost-effective high performance esterquats on a large scale. Asia-Pacific excluding Japan (APEJ) is envisaged to lead the global market for esterquats, with more than one-third market revenue share during the forecast period. APEJ is also anticipated to remain the fast-expanding market for esterquats. Europe and North America are also expected to high shares of the market, with the market in North America projected to register a relatively faster expansion than Europe through 2026. Demand for esterquats in these regions is mainly driven by the strict government regulations pertaining to utilization of eco-friendly products in end-use applications. Revenues for esterquats sales for industrial applications will increase at the highest CAGR through 2026. Esterquats seeks high demand as cationic surfactants for use in industrial applications that include paper softening, washing, and cleaning products. Surface activity, antistatic, and antimicrobial properties of esterquats have made them popular selection for various industrial applications. Based on form, revenues from liquid esterquats are expected to remain slightly larger than those amassed from dry esterquats. However, revenues from sales of dry esterquats are projected to register a comparatively faster increase through 2026.